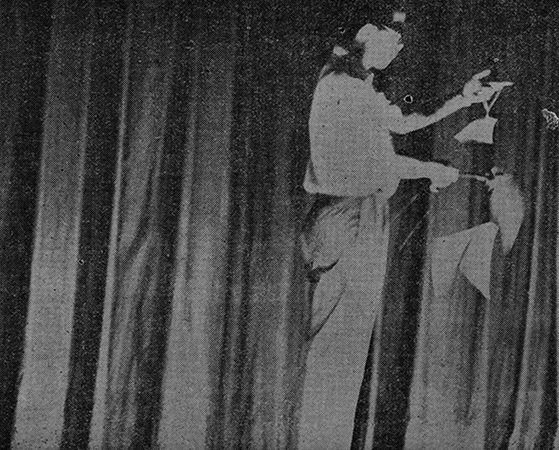 Archive image of Chen Ying-Zhen’s cracking of the gong at the opening of the first performance of the Theater magazine in 1965. Plaster Gong: Su Yu Hsien Solo Exhibition. Courtesy of the artist and TKG+. TKG+ is pleased to present Plaster Gong: Su Yu Hsien Solo Exhibition. The exhibition title Plaster Gong refers to the performance and activity organized by the Theater magazine that took place on September 3 and 4, 1965. The plaster gong was the prop that writer Chen Ying-Zhen used to open the play. Replacing the usual brass gong with a plaster gong to unveil the performance, the members of the Theater magazine seemed to have proclaimed the subversive wave of modernism. In recent years Su Yu Hsien has shifted his focus toward the development of Taiwanese contemporary art. With the Theater magazine as the background of his research on the 60s Taiwanese avant-garde art, the artist highlighted the first performance organized by the magazine in 1965. While academic attention focuses primarily on the first translated incarnation of the play Waiting for Godot by Irish writer Samuel Beckett in Taiwan, Su foregrounds in his work the experimental play Prophet by avant-garde artist Huang Hua-Cheng, as well as Chen Ying-Zhen’s cracking of the plaster gong on the opening night of said play, which was often left out in historical archives. Hidden behind Chen Ying-Zhen’s action of cracking the gong and the play Prophet was the desire to voice for Taiwanese modern art. As the action and the play were marginalized in the then conservative mainstream culture, little historical data was left on the two events, making the examination of their context difficult. Su decided to re-present these two events in an attempt to understand the avant-garde intent of the action and the performance. In addition to visiting the members of the Theater magazine and people who were at the performance in order to re-present the action of cracking the plaster gong, Su invited Zhuang Ling and Liu Yin-Shang, the actors of Prophet, to return to the stage and perform the original unadapted version of the play. Because Huang Hua-Cheng’s experimental approach was rejected by director Chen Yao-Chi, the original iteration of the play never really took place. By bringing the actors back to the audience seat like how they were supposed to be in the manuscript, through a two-channel video installation bathed in the red light that shines through a gap between stage curtains controlled by pulleys, Su reconjures the subversive structure of the play proposed by Huang Hua-Cheng and reinterprets the experimentality that was absent from the performance 52 years ago. In this exhibition, the fragility and irreversible destruction of the plaster gong, which was intended as a ceremonial object, allows Su Yu Hsien to see the indistinct and fleeting subjectivity of Taiwan. The lack of historical archives renders the plaster gong an object of imagination the sound of which echoes only in our head. Su interviewed the members who witnessed the striking of the gong on the opening night, and asked them to describe the event and to conjecture about Chen Ying-Zhen’s underlying intent. Su also commissioned sound engineers to experiment and re-create possible sounds made by the plaster gong, in an attempt to voice for Taiwan’s tenuous subjectivity. Su Yu Hsien’s (b.1982, Tainan, Taiwan) graduated from the Department of Plastic Arts, National Tainan University of the Arts. His work often addresses the underrepresented in society, culture, and history, and the possibilities of empowerment through whimsy. Selected exhibitions include A Disappearing Act, co-organized by Asia Art Archive in America and Triangle Arts Association in New York (2017); Tell Me a Story: Locality and Narrative, Rockbund Art Museum in Shanghai (2016); and the 54th Venice Biennial Taiwan Pavilion: The Heard and the Unheard – Soundscape Taiwan (2011), among others. For additional information and images, please visit www.tinakenggallery.com or contact info [​at​] tkgplus.com.